The period between Halloween and continuing right through to Valentine's Day can sometimes seem like one long party filled with one long stream of fattening fare. And forget about hitting the gym regularly. The less than festive result is going up a dress size (or more). The good news? Winter weight gain isn't inevitable. In fact, if you don't sabotage it with too much champagne and chocolate, your body actually burns more calories when the mercury drops. According to endocrinologist Scott Isaacs, M.D., F.A.C.P., F.A.C.E., you don't have to gain weight this winter—in fact, your body is working extra hard to stave off those pounds. "Scientific studies show that metabolism actually speeds up in cold weather," says Isaacs, author of Hormonal Balance: Understanding Hormones, Weight, and Your Metabolism. "Generating extra body heat means burning extra calories. We gain weight in spite of the cold weather, not because of it. That means the extra pounds we accumulate are completely due to the lifestyle choices we make when the mercury drops—and we can make healthier ones." Eat more healthy foods on the day of a party. Because you'll be tempted to munch on less healthful foods, never go to a party hungry. Instead, fill up on fruits and vegetables beforehand. It's still okay to eat at the party, but you'll eat much less if you show up full instead of ravenous. Offer to bring a low calorie dish. Other party-goers attempting to stay svelte will thank you. Ask yourself if it's worth it. Unless you really, really want-need-must-have the treat in question, give it a miss. However, if you must, then make it a petite portion. And don't mindlessly nibble on hors d'oeuvres and desserts just because they're there. Framed in terms of: "Do I really want to eat that piece of fruitcake?" - the answer is obvious. Chill out on the booze. During the holidays, many of us tend to imbibe more calorie-laden alcohol. Pace and dilute the calorie load by drinking a glass of water or diet soda before and after each alcoholic bevvy. Plan high physical activity days. One or twice a week, spread out your exercise throughout the day. Start with an early morning workout. Then spend 15-20 minutes at lunchtime exercising. Finish with a third bout of exercise in the evening. This will supercharge your metabolism and your body will love you. If you do overeat, don't "fall off the wagon." Instead, think of it like a math exercise: Make up for it by cutting your calories for a few days, and adding extra exercise. Above all, have fun! When you're enjoying yourself, there's no need to eat from stress or boredom. Just keep adding positive behaviors and don't obsess over the need to restrict "negative"—i.e., weight gain producing—behaviors. "Remember, the holidays are not just about eating," says Isaacs. "There's much joy to be found in spending time with loved ones and just savoring the season. And even in the dreaded post-holiday lull, there's plenty of fun to be had. Just focus on non-food-related fun: build a snowman with the kids or go ice-skating or just bundle up and take a brisk winter walk. That way, when spring finally comes, you'll be ready to enjoy those warmer days with a slimmer, sleeker, healthier body." 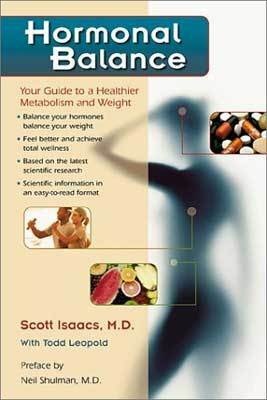 Hormonal Balance is available at Amazon.com.